I know that I promised not to talk about the Frog Plague anymore. And for those of you who sent me this link. I just have one thing to say. And so, on that note, please indulge me as the saga continues. Monday night, following a delightful dinner, the family decided that we would all head to Wal•Mart to do the grocery shopping together. Because, as a homeschooling family, with a stay-at-home mom and work-at-home dad, we don’t spend nearly enough time together. Two carts, three exhausted children, and one parent nearing a nervous breakdown later, we exited Wal•Mart and were greeted by a torrential downpour. Luckily, our umbrellas were safely tucked inside the van. Fiddledaddy sprinted out to get the van and picked the rest of us up as we waited by the claw-like machine that takes all of your quarters and gives you a big fat claw full of air in return. Not that I parted with any hard earned quarters. Because that would have been foolish. Just sayin’. We loaded the van with groceries, children, and my hair. Rain is no friend to my hair, people. It took on a zip code all it’s own. Upon arriving back at the House of Fiddle, I jumped out of the van first (holding fast to two dozen eggs) to unlock the front door, and pave the way for the unloading of the cargo. It crossed my mind that the torrential rain usually brings with it a greater number of FROGS. So, as I arrived on the doorstep I cautiously looked up. Because that’s where they usually lurk. Waiting to drop on me. When I least expect it. No frogs. I got out my key to unlock the door and saw this. The first thing I did, after backing up, was to pull out my camera. Because I figured that no one would really believe me without documentation. 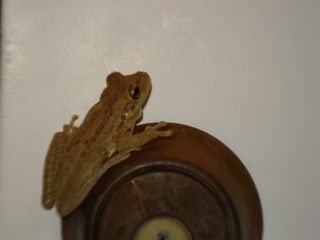 I then called forth the rest of the family, who have never taken my frog fear seriously. Fiddledaddy takes the camera from me to get a closer angle, Emme crouches and prepares to murder catch her next amphibious “pet,” and Cailey stands about 10 feet back and taunts the frog to the left, that is now quickly scaling the wall to avoid certain death. I stand WAY far back, because I’m just brave like that. 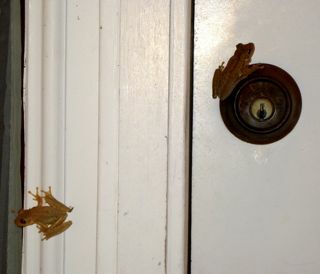 I watched, in slow motion, as the frog pushed off of the top of the door frame. With legs splayed, and beady eyes narrowed, he made an arc about 10 feet in the air, and landed right smack dab on Cailey. She screamed loud enough to wake the not living. And then burst into huge heaving screaming sobs, as she jumped up and down. At this point, the frog having had his fill of fun, jumped down off of her back, and hopped away. Chuckling to himself. And being the good mother that I am, I ran over to comfort my 6 year old tutu wearing princess. I burst into laughter. The kind of laughter that causes tears to run down your face while you experience a Depends moment. But the important thing is that I DID NOT BREAK A SINGLE EGG. We managed to get her into the house and calmed down. After an hour or two. She has since vowed never to enter or exit the front door ever again. We’ll be tunneling out through the back from now on. Like gophers. At least now I’ll have someone to share my little Frog Phobia. And maybe we’ll get a group rate for the therapy we so obviously are in great need of. Your poor daughter…I would have freaked out!! Even the pictures gave me the shivers. You laugh at that article? Exactly HOW MANY baby dinosaurs have you had to evade getting out of the front door. I am laughing so hard into my coffee this morning. It’s bad to laugh at other’s misfortune isn’t it? I just can’t help myself. This is the funniest thing I have read in ages. Someone, or Somefrog, somewhere is seriously messing with you, my friend! I used to be a Cailey when I was her age. I would catch toads and frogs and hold them even while they let forth that lovely liquid all over my hands. Now, I’m just sayin’ “no”. I can’t wait til my daughter becomes infatuated. Thanks for the early morning laughter! This should be a book. I look forward to the next installment with much glee. I’m with you on my hatred of frogs and where they are lurking. My first TX experience with them occured while I was trying to put on my shoe in our screened in patio. I kept trying to jam my foot into my shoe. After my 3rd failed attempt I smacked my shoe against the wall only to have a huge toad fall out of it. My second nasty occurance with one was while my out of state friends were visiting. One of my friends came out to tell me that her son had lifted the lid to use the toilet and hanging under the seat was a frog! It made me wonder how long the frog had been in that postion and how many times he may have been “right below me”. We now have a cat who will eat the little frogs- the teeny, tiny ones. It is quite disgusting, but it does keep them out of our way! I have been enjoying your stories! I think it’s time for the Family o’ Fiddle to add on a garage. And get their own show on CMT, to air right after My Big Redneck Wedding and before Country Fried Home Videos. I can just imagine my daughter acting the same way and then my reaction being exactly the same as yours. I would have been on the ground crossing my legs, dying of laughter. The frog plague is so great, I love to read of your pain for my amusement. I was laughing hard enough – then I read Kelli’s post! I’m tellin’ ya – you better go get that frog you dropped off at the -car dealership – was it? He’s put a hit out on you! PS – Do you always have a camera with you?! I have to admit I laughed right out loud. I am glad that only my dogs heard me and really didn’t care. I am really hoping for more frog plague updates because I can admit that I enjoy other people being tortured. I am kinda fun like that and I can admit it. DeeDee, you MUST write a book about this for sure! And with spring upon us, it’s bound to continue! I totally almost sent you that article as well! And then I decided that was just plain silly since I don’t even know you. But I thought about it. I have to admit that when you declared a frog moratorium, I was disappointed. Now that the moratorium has lifted I am a happy camper at FrogLOL once again. Keep ’em coming ‘cuz spring is just around the frog infested corner. That and slimy earthworms . . . I never knew I had this phobia, but I think I do too! I would give up the ghost if a frog landed on me. Oh my goodness! I totally would have freaked out! Your stories make me laugh! You do such a great job telling them! I actually laughed out loud when I read this and then I had no idea how to explain to my husband what I was laughing at. I cannot imagine the terror of being stalked by an entire species. I’m with you on the tunnel thing. It’ll be just like “The Great Escape” except it would have a happier ending. I know you think we are tired of the frog stories, but you would be wrong. You could start a whole blog about it and I would tune in. Congrats on the eggs! That’s impressive. Yes. Fiddledaddy gave me a little pink Sony camera for Christmas, and I always keep it in my purse. Because you just never know. I’m glad you all are ribbeted by my pain and suffering……..
Makes me remember the time we had a plague of crickets. It was so bad, they were jumping on our bed at night inside our apartment. Did I mention that our bedroom was upstairs?! That’s a lovely thing to wake up to at 3am. I enjoyed your story immensely! Good chuckles, thanks. I’m here by way of Heather at Untraditional Home. YOU ABSOLUTELY HAVE ME IN STITCHES! (Yes, I was shouting that!) Hilarious!! hey, look at the bright side, if your daughter won’t leave the house you won’t have to worry about the boy’s! Please, please never stop with the frog stories. I have a feeling the frogs are not going away so the adventures will keep happening, unfortunatete for you, happy for us. Oh my gosh, I am crying laughing! I’m so glad to have discovered your blog. See, I am allowed to laugh at your frog woes because I have an awful infestation of my own (scorpions, in my case) so I know exactly how you feel! If you want to commiserate I blogged about it (of course) here. Keep us posted!